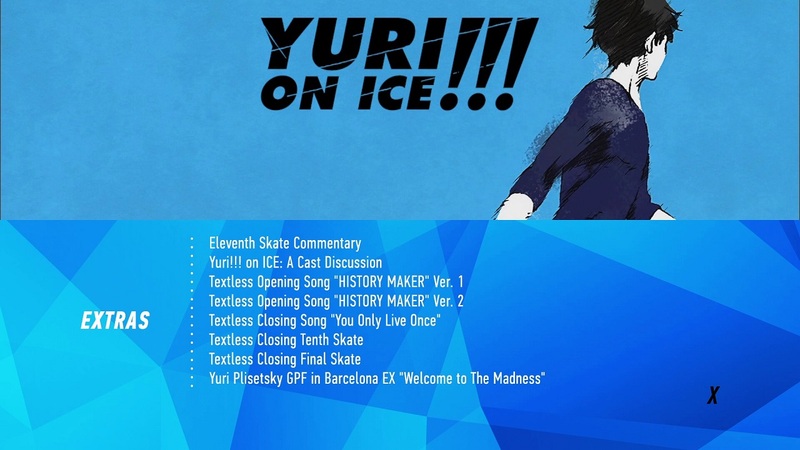 Sony Pictures Home Entertainment continues to slowly release FUNimations catalog of titles within the UK and this time the highly popular Yuri on Ice!!! gets the Blu-Ray and DVD Combo Pack treatment. Unfortunately we won’t be able to explore both formats but let’s take a look at what you can expect from the well presented High Definition Blu-Ray release of the series. After suffering a humiliating loss at the Grand Prix Final, Japan’s number one skater, Yuri Katsuki, is ready to hang up his skates for good. But when his idol and five-time champion Victor Nikiforov offers to be his coach, Yuri’s put on a trek for gold and to discover the true meaning of victory! Together, they’ll face skaters from around the world while discovering where their true feelings lie. Beautifully animated, well choreographed and an emotional thought-provocative story is what Yuri on Ice!!! offers and it truly lives up to the hype received during its initial broadcast in 2016. It rasies the bar on what a ‘sports related’ anime needs to be and unlike Haikyu or Ping Pong: The Animation it does so with added flair and depth. Unfortunately this positivity, for me at least, only last during the first half of the series as the remaining episodes felt like it was being presented on auto-pilot; with rinse and repeat animation and storytelling of going for gold. Disappointing may be; but was still an emotional thrill ride for those involved. Yuri on Ice!!! follows the journey of Yuri Katsuki, Japan’s seemingly number one figure skater who finds himself wallowing in self-pity and depression as a result of his humiliating loss at the Grand Prix Final tournament. 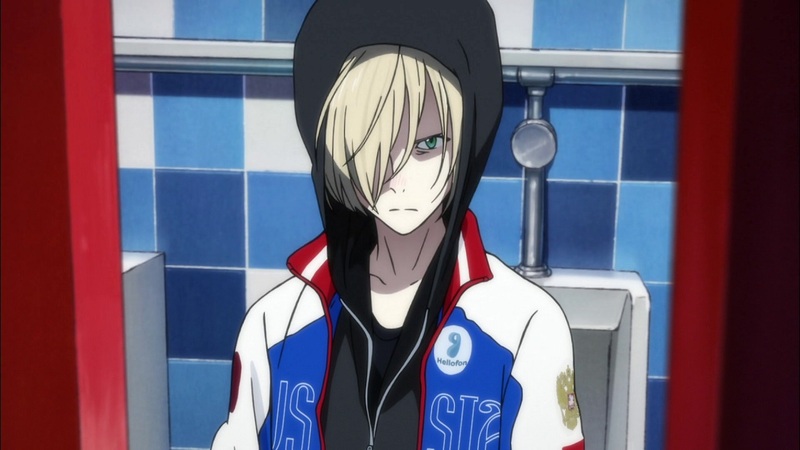 Debating whether or not to quit skating Yuri returns home and in doing so demonstrates to his old skating-friends a ‘perfect copy’ of Victor Nikiforov’s skating style – who is Yuri’s favourite figure skater and inspiration (of sorts) for competing in the sport. When footage of Yuri’s replication of Victor’s performance goes viral Victor decides upon himself to venture to Japan and in search of Yuri. 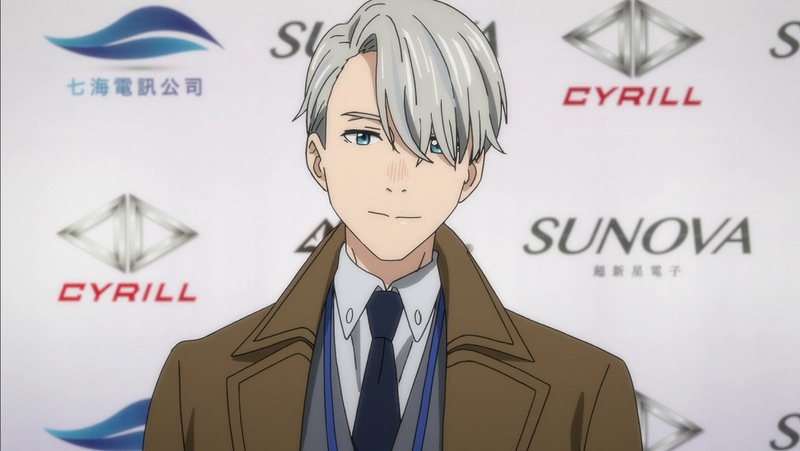 This three-episode-long debacle sees Victor Nikiforov, who is undoubtedly Russia’s number one figure skater, travel to Japan in an attempt to befriend and learn more about Yuri – while in doing so trying to reignite Yuri’s passion for the sport. In Russia meanwhile Victor’s ‘official’ student, known as Yuri Plisetsky, becomes aware of Victor’s sudden disappearance and disappears himself to Japan in order to find out whats happening with his tutor. Here the birth of a rivalry between Japan’s number one figure skater Yuri Katsuki and Russia’s upcoming skater Yuri Plisetsky (later nicknamed Yurio by local members of the at the ice ring) is born; with both competing for Victor’s affection and support. This is easily the highlight of the series and shows the lengths that two competing skaters will go to in order to get what they desire. Ironically this is only the start of the tale; as after the birth of this rivalry Yuri Katsuki (with Victor now deemed as his official coach) declares to enter the Grand Prix Final – which is of course the biggest figure skating event within the world and the event that Yuri lost in the previous year. However before being able to do that Yuri must train and make it through the qualifying stages to secure his position within the tournament. As such we see Yuri and Victor train together, in almost ‘yoai’ fashion before being thrown headlong into competitive environments which see judges award the score depending on performance. It is here (in my mind at least) where Yuri on Ice!!! 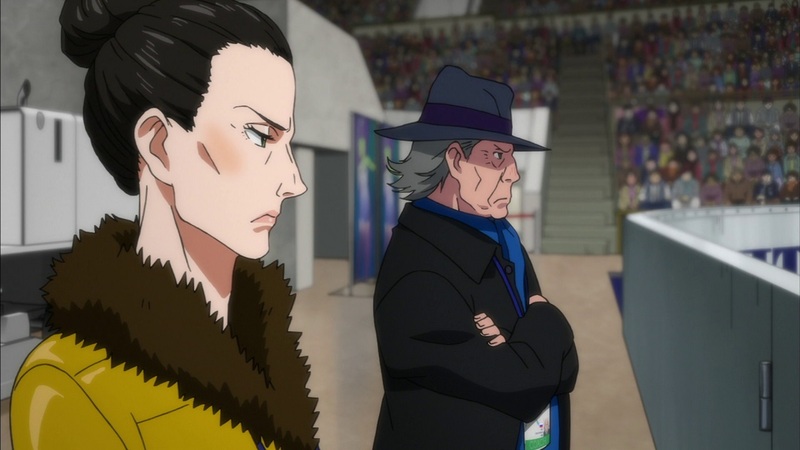 begins to fail slightly; as while it is great to see characters make their appearance and Yuri overcoming anxiety and depression to secure winning positions, the performances from the skaters and the music used are all the same. Naturally this is to be as expected as this is how figure skating events are held – with skaters using the same musics and moves through a season – but as a newcomer to the idea it felt repetitive and stale; especially after the fourth time of seeing the same music and routine within a short time frame. Understanding the rules and logic behind figure skating could numb this oversight down but even the series does very little to explain how competitions are played out other then when it absolutely needs to. This slight disconnect from viewers knowing what to expect and understanding what to expect means that the remaining half of this series could fit into three episodes of actual storyline content; and that’s before you get to episode ten which is simply a recap episode from Victors perspective. It’s not all gloom though as during these performances the ‘repetitive’ nature of the performance from each character is overshadowed by the personalities and ideals of that skater being brought to the screen; as well as why they believe they should win the competition. It’s a mixed second half; but it does have some high moments of emotional drama. As one would expect these Blu-Ray discs use the same disc masters as those used by FUNimation in North America; with the one exception being that promotional trailers for other ‘FUNimation’ related products have been removed. This means we do not receive a skippable trailer at the start of each disc nor do we get any trailers in the ‘Extras’ portion of the second disc. So far it has been the same with all past Sony Pictures Home Entertainment releases and it seems that won’t be changing anytime soon – which is a bit of a shame as I enjoyed watching those trailers. In terms of supplementary content the second Blu-Ray disc features all of the bonus material; with ‘video’ English cast commentary being included alongside textless opening and closing elements of the series. 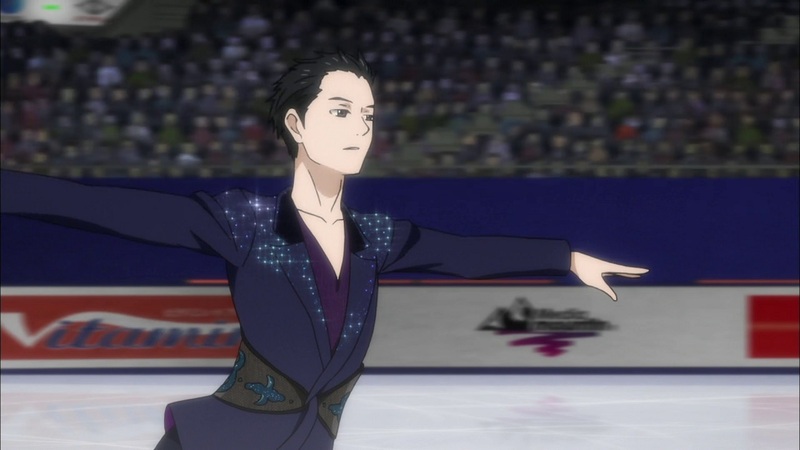 In addition viewers will also find a complete animated performance of Victor Nikiforov figure skating skills as well as a ‘Cast Discussion’ in which the English cast, including ADR Director Sonny Strait, discuss their experiences with Yuri on Ice!!! 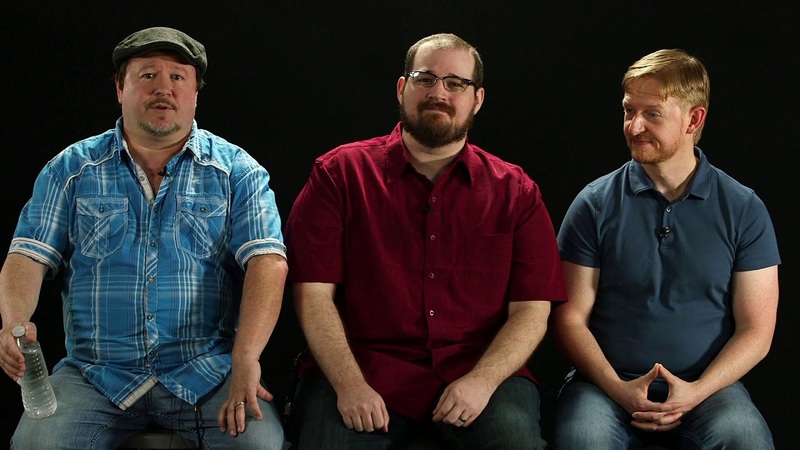 and what they thought of the series from a personal level. It’s an interesting watch and its clear to see that Sonny Strait wanted to deliver the best English Dub performances for this series; and upon watching the series in English it shows. Yuri on Ice!!! is one of those rare anime series that regardless of what you think it’s worth watching for the experience. 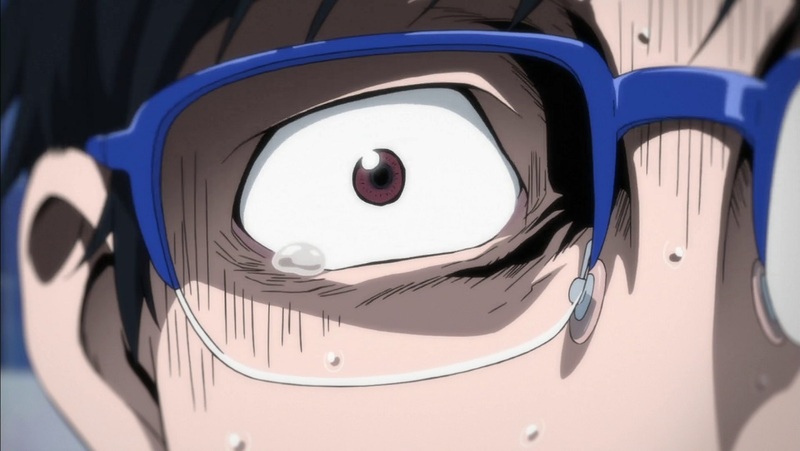 Originally I had no interest in watching Yuri on Ice!!! – even more so during its original simulcast broadcast on Crunchyroll – but upon giving the chance to watch this Blu-Ray release I was pleasantly surprised by the story it had to offer. This isn’t simply another story about wanting to be the best at a certain sport; nor is this specifically a sports anime. It’s a story which sees one man overcome anxiety, depression and misery to deliver the best figure skating performances of his career; all the while helped by his idol and current best figure skater in the world. Even when competing in the tournaments to take him to his goals; Yuri still overcomes those doubts – and its a great motivational story executed to high standards. 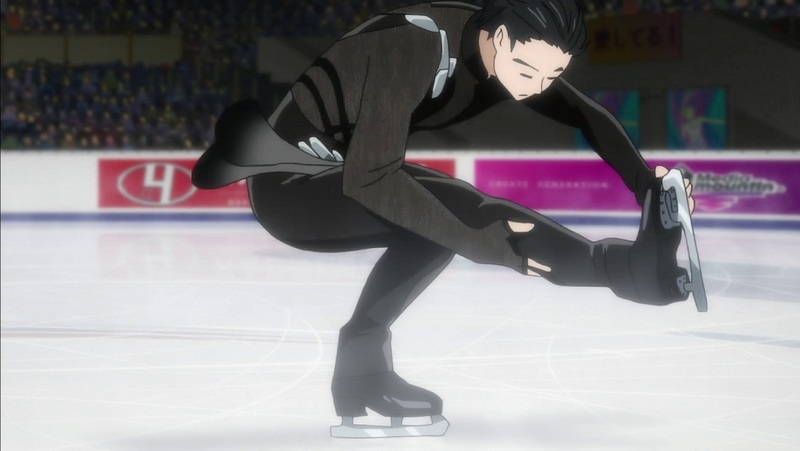 Truth be told I didn’t care much for the figure skating presentations but I appreciate the effort from music composers Taro Umebayashi and Taku Matsushiba as well as the choreographed by Kenji Miyamoto; as these beautifully crafted and animated moments make the series shine and give the backbone of authenticity that it deserves. Naturally I wasn’t here for the figure skating, although it is a big part of it, I was here for Yuri and his ever-growing relationship with Victor and rivalry with Yuri(o); and for this alone it was fun and entertaining to watch until the very last moment – that is if you exclude the repetitive nature of the figure skating performances. Whether or not you like figure skating Yuri on Ice!!! offers something truly exceptional with a mixture of realism, comedic elements and a growing cast of interesting characters. These characters are brought to life – even more – with the strong voice cast. For this occasion I stuck with the English Dub track and kudos have to be given to FUNimation for trying to replicate certain accents of certain countries with the voice actors giving a ‘local’ spin relevant to the country of each character. The obvious being Russian as this is mostly used. Whether or not it is a good Russian interpretation remains to be seen; but it made the presentation of the English Dub a lot more believable and added another sense of realism. Japanese audio is included for those that wish to watch the original Japanese performance. Overall Yuri on Ice!!! is a well crafted and presented anime series; that has a few faults during its later half. Naturally it is not my type of show but it does offer a unique experience and a nice change of pace to types of content we usually see. Love it or loathe; Yuri on Ice!!! is worth checking out BUT only if you like male focused ‘yoai’ themed interactions between characters. On the flip side this Blu-Ray release is as one would expect and presents the series to the best of its abilities; so another high-priase for Sony Pictures Home Entertainment UK. Yuri on Ice!!! – The Complete Series is available as a Blu-Ray and DVD Combo Pack within the UK via Sony Pictures Home Entertainment.